Some of the suggestions from my first wishlist have actually been implemented in Cities: Skylines. Naming roads, and adding directional traffic overlays were recently added in the Mass Transit expansion, and the previous Snowfall expansion incorporated some of my ideas for seasonal cycles (minus the part where the seasons actually cycle from one to another). There's still a lot of items from that wishlist that haven't been implemented. I also have come up with some new ideas for things I'd like to see in further expansions (or maybe a sequel?). Even though Cities: Skylines is, by far, my favorite (and probably the objective best) city-building / city-simulation game of the past decade, there are still some features and ideas from the inferior games that I really like. In my first wishlist, I already talked about how much I liked the modular building mechanic of SimCity (2013). I won't go into too much detail of why I liked that concept (even though the actual implementation was a little weak) because I invite you to read the original post. Suffice it to say, I liked the idea of certain pieces of city infrastructure (such as power plants, schools, universities, police stations, airports, government buildings, etc.) actually growing along with the city. 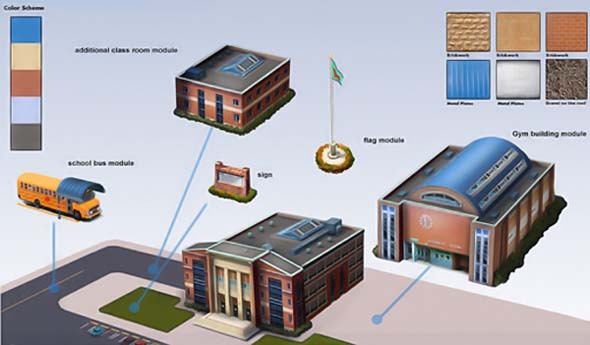 Being able to upgrade an existing building to add additional functionality, additional capacity, or to specialize it in some way, was (in my opinion) a much more interesting and engaging process than simply plopping another copy of the same building every so often, or adjusting a global budget slider, simply to meet increasing demand. I still think SimCity had the right idea with its modular buildings. In that first wishlist, I also briefly mentioned the Cities XL series. There isn't much in XL (or XXL) that is done as well (or better) than what is offered in either SimCity (2013) or Cities: Skylines, but I did neglect one idea that I think was probably the most clever, interesting, and fun part of the XL series of games: the ability to "fill" an area with "decoration". 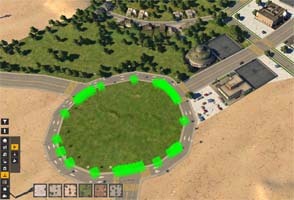 Put simply, Cities XL allows the player to fill any unoccupied area of the map (that is at least partially enclosed by roads) with one of several different types of decorative landscaping. Landscaping options include a grassy park area with trees, an open-air "flea market" with kiosks and street vendors, various plazas / courtyards, and even a makeshift construction site. These decorations aren't functionally different (the flea market doesn't produce any commerce or jobs, for example), but each decorative area applies a very small environmental beautification effect that increases happiness and land value for adjacent homes or businesses. 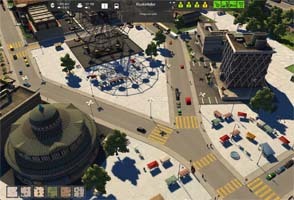 Decorative areas in Cities XL allows you to fill-in irregular shapes with city-beautification projects. From a more aesthetic standpoint, Cities XL's decorative areas allow the player to make very efficient use of space, to fill any empty dead space, and to create your own custom parks and plazas that conform to whatever shapes the outlining roads happen to be. Want a park in the middle of a large roundabout? Want a plaza space at the point of a 45-degree (or narrower) intersection? XL allows you to do such things without having to go into an asset-editor to make a custom ploppable. With Starships released, an expansion for Beyond Earth announced, and support for Civ V apparently done, I thought it would be a good time to take a look back at the game. I'm going to spend a few posts to discuss what Civ V did right, and what it did wrong, so that future games can learn lessons from this iteration's successes and failures. 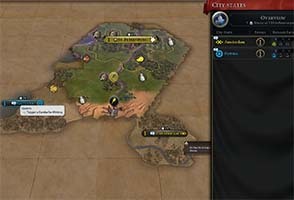 Here I will present a Top 10 list of my favorite new features, mechanics, and design philosophies in Sid Meier's Civilization V (and its two expansion). These are the elements of the game that stood out the most to me as contributing to the fun and addictiveness of the game, and which push the series in positive directions. Most of these features are things that I would probably like to see return in future sequels. But even though my intent here is to shine glowing praise on Civ V, I'm not going to ignore the faults of even my favorite features. Some of these mechanics are great ideas, but still suffered from problems in execution. So I won't shy away from constructive criticism where applicable, and I'll make recommendations to improve these great features in the future. In a future post, I will also look at the things that Civ V got wrong. Of course, any list of "good ideas" or "bad ideas" is going to be subjective. You may not agree with my opinions, and that's OK. 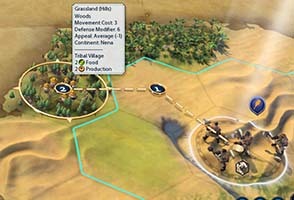 If there's any features, mechanics, or design decisions that you really love in Civilization V, its DLC, or its two expansions, please feel free to leave a comment!